New to Boulder and looking to be a responsible eco-citizen? Do you live on a historic property in downtown Boulder and need to transplant grown trees carefully? Are you part of an affordable housing development that needs to relocate mature trees for building work? If you need any type of tree moving in Boulder, Tree Taxi can relocate your trees, keep the city beautiful, and help you live up to your environmental responsibilities! While tree moving isn’t easy in Boulder, we take the job seriously and have more than 20 years of tree moving experience to get the job done right. Boulder and Boulder County take their trees seriously. The city of Boulder, alone, looks after more than 50,000 public trees in city parks and streets. If you’re like most Boulder residents, you know that the trees provide environmental benefits, food and shelter for wildlife, and beautify this terrific town. If you have a tree you’d like to relocate, contact us! We’ll work with you to identify the tree type, the tree diameter, where the tree is located, and what other structures are around the tree. Our best-practice approach will determine the soil type and prepare for the best time to move your Tree. 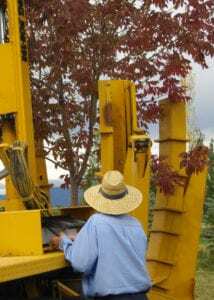 Contact us – we have more than 20 years of tree moving in Boulder!